Over the last 16 years in ministry, I have served under the leadership of some wonderful elders. They have done so many things to encourage and shepherd me. Sadly, some preachers get little to no encouragement from the elders under whom they serve. So I thought it might be helpful to share some of the things my elders have done for me over the years, in hopes that other elders would do the same for their preachers. 1. Meet regularly for a meal or a cup of coffee. Preachers shouldn’t have to be afraid when their elders want to sit down and visit. Sharing a meal or a cup of coffee should be a regular occurrence between preachers and elders. Ministers and elders are Christian family before they are anything else. 2. Be the shepherds, so ministers don’t have to. Any type of ministry is much more than a full-time job; it is a lifestyle. Ministers are always studying, always thinking, always preparing. It is so wonderful to work alongside elders who proactively and intentionally shepherd the flock, so ministers can focus on their particular areas of ministry. 3. Treat them as co-workers. Elders certainly oversee the work of ministers, but that doesn’t mean it should feel like an employer-employee relationship. Elders and ministers are co-workers in the kingdom. Most of my elders have treated me like I work with them and not for them. I think more elderships need to adopt this mentality. 4. Pray for them and with them. Not long ago, I mentioned from the pulpit that my family had experienced a terrible loss. After worship, the elders took me aside and prayed for me. I have one elder who regularly stops by my office to pray with me. I cannot begin to describe how encouraging this is. Ministers and elders should constantly be praying for and with one another. There will be no power in the pulpit or in the eldership if there is no prayer amongst them. 5. Love and appreciate their families. There should NOT be a tension between a preacher’s family and his eldership. Elders should not be pulling him in one direction and his family pulling him in another direction. Too often ministers feel like they must choose between pleasing their elders or their families. This shouldn’t be the case. My elders have always recognized that my most important ministry is to my wife and boys. They have insisted I take time away from church work to be with family. Furthermore, I could not do half the things I do in ministry without the help and support of my wife. Elders help keep me going when they recognize and verbalize this fact. 6. Play to their strengths. No minister can be everything to everybody. No minister is good at everything. Everyone has their own particular strengths and abilities. Some ministers are great at conducting one-on-one Bible studies, some are great at visiting the sick and the shut-in, some are great at proclaiming truth from the pulpit, some are great at doing service work. Each minister – like each Christian – is a unique part of the body of Christ (Romans 12; 1 Corinthians 12). Wise elders will not try to force a minister to be something he is not. They will encourage him to work in areas in which he excels and support and supplement him in areas where he struggles. 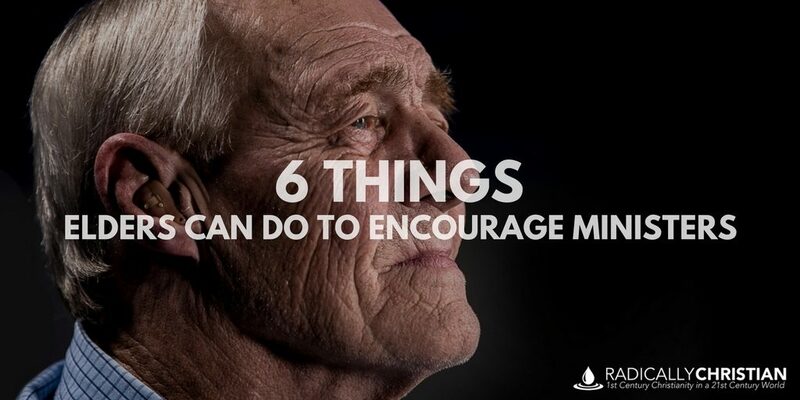 I hope if you are an elder – or you know an elder – these suggestions might help improve the relationship between elders and ministers in your congregation. No matter our role in the church, let’s all be a blessing to one another.